Ferrari 159 S (1947) was the second Ferrari vehicle, succeeding the Ferrari 125 S that had won six of 14 races earlier in 1947. Only two 159S were built, one of these rebuilt as a Ferrari 166 Spyder Corsa, and as of 2012, the oldest remaining Ferrari. It was basically a Ferrari 125 S with a larger engine (larger bore) and very minor cosmetic differences. The engine was a 1.9-litre (1903 cc/116 in³) 60° V12 with a bore/stroke of 59 x 58 mm, producing 125 bhp (92 kW) at 6,500 rpm with a compression ratio of 8.5:1. It was a single overhead camshaft design with 2 valves per cylinder and three Weber 32DCF carburettors. 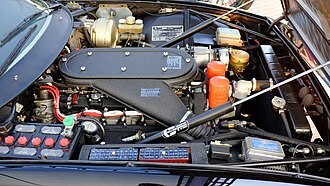 It had a five-speed manual transmissions and retained the Fiat tradition of mounting the engine in-block with the gearbox. 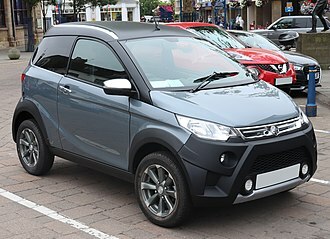 It had a steel tube-frame chassis, independent wishbone suspension with transverse leaf springs in front and a live axle in the rear and hydraulic shock absorbers all round. Drum brakes were specified front and rear. The 159 S debuted for Scuderia Ferrari on August 15, 1947 at the Circuito di Pescara with the company's driver, Franco Cortese, coming in second. Although it led overall for a time, the class-winning 159 S eventually fell behind the Stanguellini of Vincenzo Auricchio. Like the 125, the 159 S was unable to beat Maserati's 6CS 1500 for much of the rest of the 1947 season. However, at the 1947 Turin Grand Prix on October 12, the car was able to shine, with French driver Raymond Sommer claiming overall victory in the single 159 S entered. One of the originals in 1947. It was sold to the Besana brothers of Milan, and converted into a 166 Spyder Corsa for the 1948 racing season. 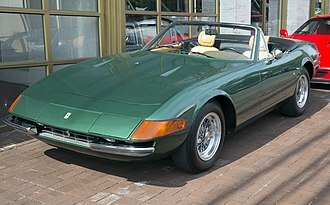 As of 2012, the car has survived and is considered the oldest Ferrari car in existence. It has since an auction in 2004 been owned and raced by Ferrari collector and restorer James Glickenhaus. ^ 1947: il primo anno della Ferrari from Modelfoxbrianza.it. ^ Circuito di Pescara 1947 from www.racingsportscars.com. ^ Luigi Brandoli, 12 Ottobre 1947 - 2° Gran Premio Città di Torino, from La storia di Lancia Marino. ^ Ferrari 1947 at classiccarcatalogue.com. ^ Ascerbi, Leonardo (2006). Ferrari: A Complete Guide to All Models. Motorbooks. ISBN 0-7603-2550-2. ^ Anthony Bond, World's oldest Ferrari is unveiled following restoration... and it's now worth a cool $8M in Daily Mail on August 20, 2012. ^ 1947 FERRARI 166 SPIDER CORSA TWO-SEATER SPORTS RACING CAR from www.christies.com. ^ 166 Spyder Corsa 002C from www.barchetta.cc on April 1, 2016. Automobili Stanguellini is an Italian maker of small sports cars, based in Modena and founded by Vittorio Stanguellini, it was most active between 1946 and 1960. They continued to produce cars until 1981, when Vittorio Stanguellini died, thenceforth. The Stanguellini family has had an involvement with the motor car. 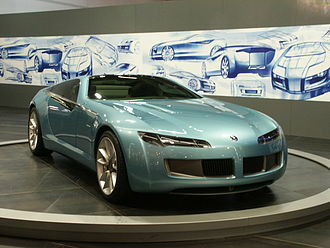 Vittorios grandfather founded a company in 1879, and his father was the first one in Modena to register a car. By the time Vittorio took over, in 1929, the business included a FIAT agency. 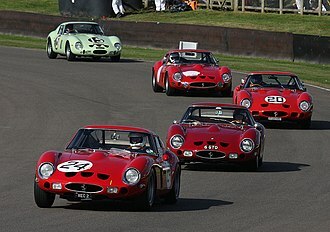 Vittorio Stanguellini began tuning and modifying Maserati, Alfa Romeo and Fiat cars for racing and he was a friendly rival of Enzo Ferrari in Modena beginning in the late 1920s. Vittorio formed Squadra Corse Stanguellini in 1938 and quickly found success when he modified a Maserati 6CM which took the victory at the 1938 Targa Florio. 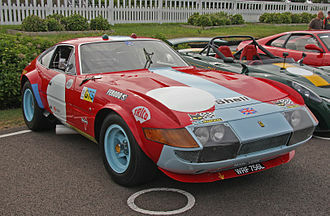 Stanguellinis cars competed in sports car racing events and major alike. Vittorio Stanguellini used his experience tuning Fiats in the pre-war days, focusing on the 750 &1100 cc classes, Stanguellini sports cars were beautifully engineered cars with light-alloy cylinder blocks, twin overhead camshafts and dual side-draught Weber carburettors. This would add up to a claimed 60 bhp at 7500 rpm from the 741 cc sports engine and 90 bhp at 7000 rpm from the larger engine, providing top speeds of around 180 km/h and 190 km/h respectively. 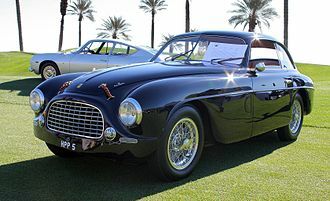 Unlike many other of the so-called Etceterinis, Stanguellini were loath to use foreign parts, bodywork was usually by local Carrozzeria Reggiano. 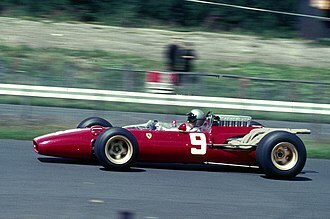 Vittorio Stanguellini tried very hard to gain a win at the 24 Hours of Le Mans, with his limited resources, he never was able to achieve this. His best finish was a fourth in class, Vittorio Stanguellini had been making special aluminum twin-cam cylinder heads for the Fiat 1100 block since 1947. However, in 1950 he finished his most ambitious project, a complete 750cc racing engine - designed from a sheet of paper by Oberdan Golfieri. This was a light weight 9000 rpm engine based on a specially cast aluminum block, Stanguellini racing cars achieved extraordinary success worldwide with this engine in the 1950s, including numerous national championships in Italy and France. 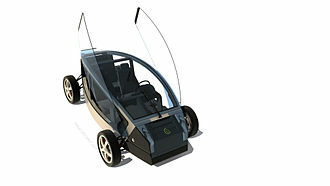 Gioacchino Colombo was an Italian automobile engine designer. He began work as an apprentice to Vittorio Jano at Alfa Romeo, in 1937, Colombo designed the 158 engine for the Alfetta and caught the attention of Enzo Ferrari. 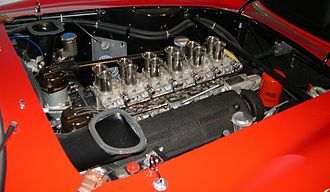 Ferrari asked Colombo to design a small V12 for use in the new Ferrari marques racing, the first Ferrari-Colombo engine appeared on May 11,1947. 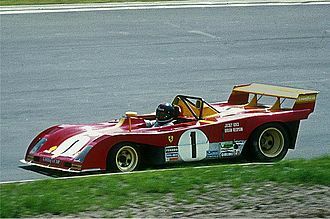 Colombos great work for Ferrari was a tiny 1.5 L V12, first used in the Tipo 125,159, and 166 sports cars. 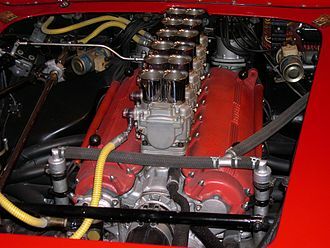 This engine, known in Ferrari circles as the Colombo engine, was produced for road cars and these included the famed 3.0 L Ferrari 250 racing, and GT cars. 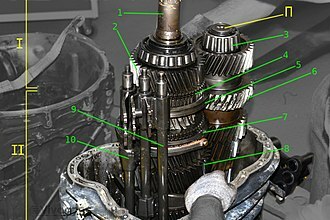 Colombos engine was not as successful in Formula One racing, after stunning early success in the 166, the engine was supercharged for use in Formula One but failed to perform well. 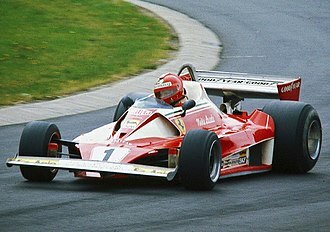 Ferrari hedged his bets, as he often did, by bringing on competing designer Aurelio Lampredi to create a naturally aspirated V12. 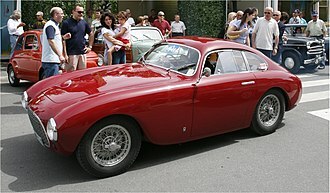 Later, Colombos former mentor, Vittorio Jano, came to Ferrari, Colombo left Ferrari in 1950 and returned to Alfa Romeo.